A couple of weeks ago I was contacted by the team at Wheyhey ice cream and asked whether I’d like to sample some of their ice cream. To be totally honest, I’d never actually heard of Wheyhey. So, although my initial response was yes please, I had to find out a bit more first. After reading through their product information, I was more than happy to accept the offer. One week later, on one of the hottest days of the year, it arrived. The well insulated box contained 4 mini tubs - one of each flavour: strawberry, chocolate, vanilla and a banoffee. 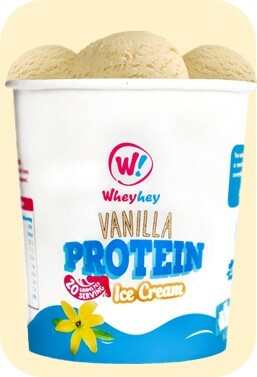 Wheyhey is a high protein ice cream, with the protein coming from, you guessed it, whey! It’s sweetened with xylitol, which is a natural sweetener. Contrary to sugar, Xylitol is not only good for teeth, it has a low glycaemic index and a third fewer calories. Wheyhey ice cream, made in Ireland, is gluten free and suitable for diabetics and vegetarians. It’s also low in fat and has no sugar. Each 150ml pot contains 20g of the highest quality whey protein isolate. This ice cream could be a useful alternative source of protein for veggies who don’t eat meat. 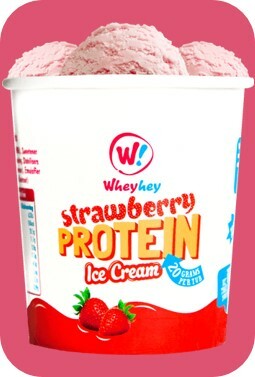 Compared to other ice creams, Wheyhey is miles ahead in the protein stakes. 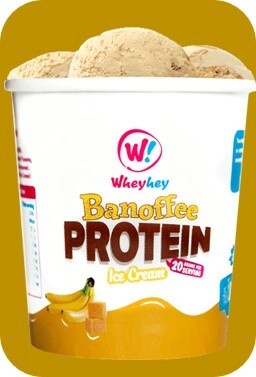 The average amount of protein per 100ml in other icecreams is around 3g per 100ml whereas 100ml of Wheyhey ice cream has 13.4g of protein. This is roughly the same amount of protein as found in 100g of soy beans, one and a half eggs, 100g of cottage cheese or 150g of tofu. I asked all the family which flavour they wanted. Luckily there weren’t any arguments. As there are four pots and five in my family, I generously forgo a whole pot to myself, instead, settling for a small sample of each flavour. 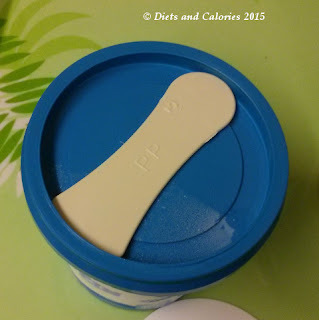 Each little pot is 150ml and comes complete with a small plastic spoon embedded inside the lid. I had left the pots out of the freezer for around 10 minutes. This was long enough for them to have melted around the edges. Taking my own spoon, I sampled each flavour in turn, taking my time to allow the ice cream to melt in my mouth so I could fully appreciate the taste and texture. I found the texture different to other ice creams. Although it’s completely smooth, it has a sort of gloopy, sticky texture. Whether this is because of the whey protein islolate or the guar gum (one of the ingredients), I’m not sure. 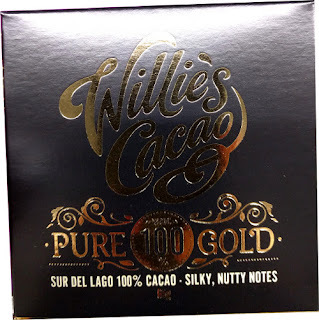 The flavours were nice enough, with each variety tasting respectively of chocolate, strawberry etc. Each of the ice creams include natural flavourings, but it would have been nice to see some real fruit, perhaps in the strawberry or the banoffee. Asking around the family, everyone agreed they liked them and would be happy to have them again. 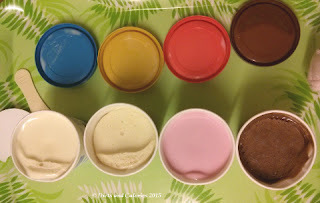 The older members also thought the consistency was a bit different to other ice creams, somewhat on the gloopy side, but they didn’t feel it detracted from the flavour at all. Each pot has around 150 calories, which isn’t too bad. I think this ice cream would be great with some fresh fruit added to make it into more of a dessert. And with all that protein, it would be quite filling too. Wheyhey ice cream is also available in 500ml pots. 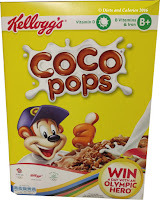 At the moment, some of the places you can find it includes branches of Holland and Barrett, Whole Foods stores, As Nature Intended and online at Ocado. 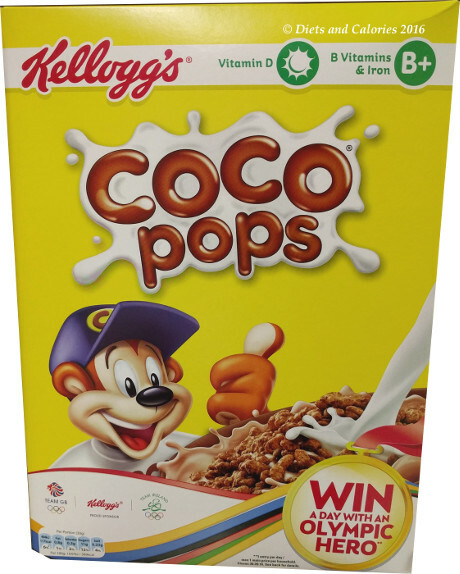 Nutrition information per 100ml Strawberry: 100 calories, 2.9g fat, 1.8g saturates, 7.8g carbohydrates, 7.8g sugars, 13.7g protein, 0.1g fibre, 0.06g sodium. You can find out more about Wheyhey ice cream at their website. I think the strawberry one tastes as complete rub*ish-pasty consistency, artificial & chemical taste-not worth the calories (for extra 50-70 kcals you can get real ice cream) nor the price. Horrific product!! !